On September 16, 2016, the first session of the TOMODACHI MetLife Women’s Leadership Program (TMWLP) in Okinawa was launched. Several program alumni attended to share their experiences participating in the program. Alumni mentee Azumi Nakai shared how the program helped her gain confidence and even overcome depression through her exposure to so many inspirational women. Mai Kinjo, another alumni mentee, presented in English for the first time and spoke about how the program and having a mentor really opened up her world to new experiences that made her want to challenge herself more. Kinjo’s advice: “Be a yes [wo]man.” Like the Jim Carrey movie “Yes Man”, Kinjo recommended that students say “yes” to every opportunity presented to them throughout the program, even if they are afraid. Her mentor, Yumiko Ichikawa, who also attended the session, was moved almost to tears by the progress that Kinjo had made and the confidence she had developed due to the leadership training and their mentoring sessions. The program kicked off in September in Osaka, Tokyo, and Naha, and will launch for the first time in Sapporo, Hokkaido on September 30. This is the first year since MetLife Japan renewed their commitment to TOMODACHI and this program, in order to continue the women’s leadership program through 2020 which will impact a total of 500 women across the country. This ten-month program pairs university students with mentors who are mid-career professional women working in Japan. 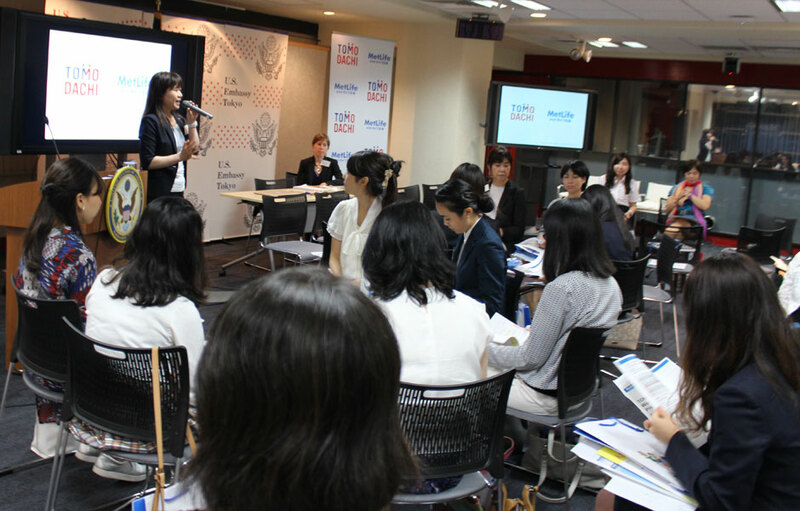 For the first session, the university students were paired with their mentors, and U.S.-Japan Council Leader and the Executive Director of Diversity & Inclusion Services at Ernst & Young Advisory Co., Ltd. Japan, Janelle Sasaki, also led a session for the mentors providing guidance on how to be an effective mentor. During subsequent sessions, in addition to having a mentor, students undergo personal leadership development and financial literacy training in order to foster leadership skills, promote financial empowerment, encourage networking, and increase self-confidence. In March, the students will travel to the United States to meet more women leaders, interact with American students, and participate in skill-building workshops. The capstone Annual Conference in May will present the opportunity for all 100 participants in the 2016-2017 TMWLP to come together for two days of program reflection and activities. As these talented young women embark on their leadership journey with TOMODACHI and MetLife, the hope is that they will learn to harness their leadership strengths and embrace their roles as the future women leaders of Japan.